WEST WINDSOR – Break out the straw fedora, white sport coat, or the floral print dress and get ready for “A Night in Old Havana,” the theme for this year’s Mercer County Community College (MCCC) scholarship fundraiser, “Spring Into Student Success,” to be held April 5. Now in its 30th year, “Spring Into Student Success” will be held on Friday, April 5, from 6 p.m. to 11 p.m. at The Stone Terrace, 2275 Kuser Road in Hamilton, with all proceeds to support student scholarships. Event co-chairs are Nina D. Melker, senior vice president at Berkshire Bank; Peggy Iucolino, assistant director of client and community relations at PNC Bank; and Mercer County Freeholder Pasquale “Pat” Colavita Jr.
Each year the MCCC Foundation awards hundreds of scholarships to high-achieving and financially-eligible students, including non-traditional students, part-time students, and single parents. Many students benefit from endowed or named scholarships established by donors through the Foundation. This year alone, more than $550,000 in direct support will be awarded to MCCC students. This year’s event features a formal dinner, including hors d’oeuvres, an open bar, coffee and desserts, live music by the Renaissance Orchestra, and a silent auction. The evening will include an awards presentation honoring community partners for their outstanding contributions and service to MCCC. Businesses and community members are invited to participate through corporate sponsorships, digital advertising, underwriting, silent auction donations, and tickets to the event. For more information, visit www.mccc.edu/siss, e-mail listr@mccc.edu or contact Roxanne List at (609) 570-3616. 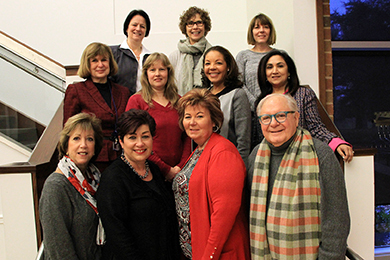 “Spring Into Student Success” steering committee members: Front row, from left: Foundation Chair Lori Danko, SISS Co-Chairs Nina Melker, Peggy Iucolino and the Hon. Pat Colavita. Second row: Pat Hartpence, Amy Andrejco, Paula Taylor, and Savita Lachman. Third row: Mara Franceschi, Kathy Klockenbrink, and Karen Kennedy. Not pictured: Wayne Staub, Linda Martin, John Thurber, Milena DeLuca, and Melissa Tenzer.